Update: Reddit to the rescue! The near-convincing photos have turned out to be renders created by Martin Hajek. As Redditor colinstalter points out: "He uses the same smudge texture in all of his renderings. Maybe now the media blitz will stop." First come the whispers, then the spec, size and release date rumors. Now, seemingly right on schedule, come the photos. Sonny Dickson, who gave us pics of the iPad Air and iPad mini 2 before Apple announced them, is back with what he claimed are photos of the iPhone 6's back casing. As The Verge pointed out, it appears the original source of the images is an anonymous Twitter account, @mornray886. Images posted to that account include the front of the phone, larger screen and all. The shell is in space gray, stamped with Apple's signature black bitten fruit. It's hard to make out dimensions from the images, but Dickson said that true to the rumors, the new iPhone will have a screen bigger than 4 inches. He described the iPhone's design as a cross between the new iPad and the iPod touch, and there certainly appear to be elements of those devices in the limited sample size. The photos, if authentic, show some striking changes are on the way for Apple's new iPhone. The bezel is significantly trimmed from the iPhone 5S, allowing for a larger screen. 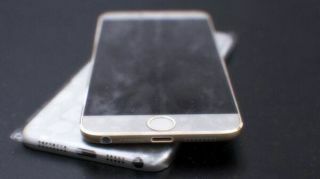 Reports have indicated the iPhone 6 display will go all the way up to 4.8 inches. Others have said Apple will launch two big screen phones this year, one with a 4.5-inch-plus screen and another above 5 inches. Unlike what a report from Tuesday suggested, the phone here isn't totally bezel-free, though the sides are nearly gone and the top and bottom have been clipped. The parts also reveal a phone noticeably slimmer than the 5S, and while it may be a trick of the eyes, the microphone on the back appears to be oval in shape, not a circle. The one main design constant between the iPhone 5S and the iPhone 6 (if we are indeed looking at it) is the Touch ID button. The Samsung Galaxy S5 will likely be here before the iPhone 6.